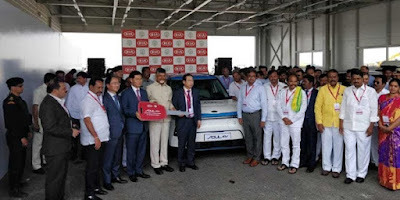 The first ever car of the Korean car manufacturer Kia Motors rolling out of its Anantapur plant will be roaming on Indian streets this July. The model will be a mid-size Sport utility vehicle (SUV) ready to give a tough fight to models such as Duster, S Cross and Creta. The Kia model SP-2 will be available in both petrol and diesel variants and the electric vehicles will come on a later date. Elaborating the road ahead for the Korean car giant, Kia Motors India head of marketing and sales Manohar Bhat said that models will roll every six months after the trial run is over. “We are going to launch three different models within one and half year,” Bhatt said. He said that the price range will be Rs 6,00,000 to Rs 16,00,000. “We are one month ahead of schedule and we will be launching the SP2 vehicle in the second half of this year. We have invested $ 1 billion from our side already and another $1 billion by the vendors. There are two vendor parks adjacent to our unit. The unit is capable of producing three lakh vehicles per year from day one,” Bhat said. “The real test is to assess the quality in terms of material. As we are known for the quality of our vehicles,” he added. He said that Kia is keen on catering to Indian market, so it has to be a ‘value for money’ car. “So, we will keep localization to a larger extent but can’t tell you an exact figure, but we will give you a vehicle that everyone will love,” he said.